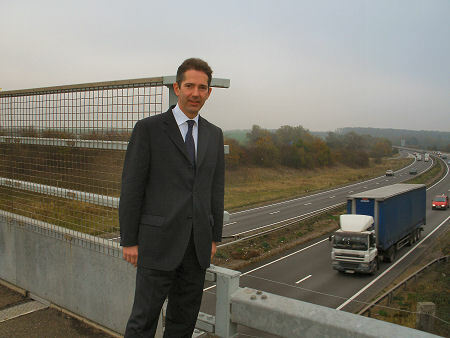 It was confirmed today by the Chancellor of the Exchequer that the A14 is now a priority project for this government. The Chancellor’s comments on the A14 made during his autumn statement means that all options for the road, including tolls, are to be put on the table and reviewed. The reviews announced two weeks ago will look at the roads existing and future capacity and performance, focusing on the needs of business and the impact of proposed additional housing at Northstowe and Alconbury. Plans are to be developed for announcement in spring 2012. In his autumn statement the Chancellor today also announced that an immediate £20 million is to be awarded for A14 junction treatment to ease congestion and increase safety. “Today's announcement by the Chancellor is good news for my constituents in Huntingdonshire and for the entire Eastern region. If traffic looks bad on the A14 now with it operating virtually at full capacity, this is nothing compared to the disastrous gridlock we shall have when the economy picks up again. That is why we must prepare to improve this road now and why I first raised the issue with George Osborne MP and Justine Greening MP. I am very pleased that the Government has recognised the critical need to upgrade the A14 and the Chancellor has now provided a strong signal of commitment for improvements.